How important is tourism to the Queensland economy? It is being reported that visitor numbers over Easter at Queensland tourism centres such as the Gold and Sunshine Coasts were at levels not seen since before the financial crisis. This is great news given the importance of tourism to the Queensland economy. Recall that tourism is one of the so-called four pillars of the Queensland economy. 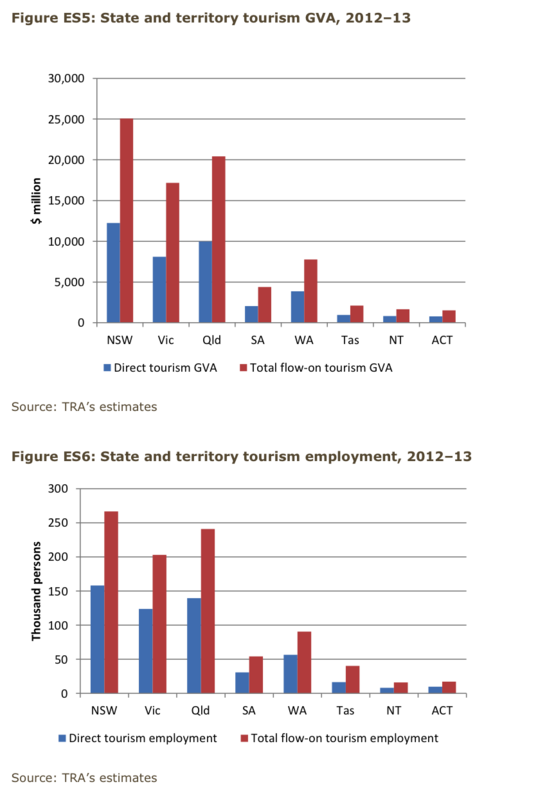 According to the State Tourism Satellite Accounts 2012-13 prepared by Tourism Research Australia, tourism directly contributed $10 billion to the Queensland economy in 2012-13, supporting 140,000 jobs (see charts I’ve copied and pasted below; N.B. GVA stands for gross value added, which measures the industry’s economic contribution). This was equivalent to 3.8% of the State economy and 5.9% of total employment. This puts tourism in third place among the four pillars, with mining contributing $30 billion, construction $26 billion and agriculture $8 billion. I haven’t mentioned the estimates of flow-on activity and employment, because the calculation of flow-on impacts is imprecise and controversial. I’ll try to elaborate on this point in a future post. This entry was posted in Tourism and tagged fourpillars, qld, queensland, tourism. Bookmark the permalink. 2 Responses to How important is tourism to the Queensland economy? Absolutely agree. Thanks for the comment, KT.